This is an update on the Ojambo.com Debian 64-bit on Acer 5720Z Spring 2008. The power adapter was replaced recently due to damage caused by someone pushing a chair over the cable. The laptop works very well and gives full charge from the battery. The new adapter is runs significantly cooler than the original adapter. The laptop is now mostly used for programming tutorials and creating mobile applications. A memory upgrade seemed worthwhile because memory is cheaper than replacing the laptop. 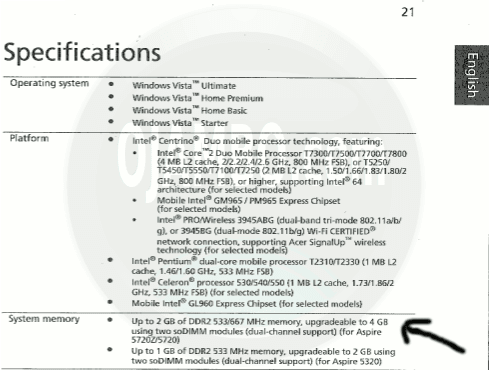 According to the laptop manual, the Acer Aspire 5720Z is able to take 4Gb of RAM. The RAM must be installed in two pieces of 2Gb to total 4Gb. The manual also specifies that RAM must be DDR2, Sodimm and 533Mhz or 667Mhz. Two 2Gb DDR2 Sodimm PC5300 PC2 667Mhz memory modules were purchased for the laptop. Each laptop module worked individually. The two laptop modules caused both operating systems to restart. It seems that the Acer Aspire 5720Z cannot take more than 2Gb of RAM despite the specifications on the manual. This disappointment means that the laptop will be replaced sooner. However it might become a Git server since it is quite. The desired results of upgrading from 1Gb RAM to 4Gb RAM were not realized. The Acer Aspire 5720Z manual is not to be trusted. The laptop cannot be upgraded to more than 2Gb RAM. 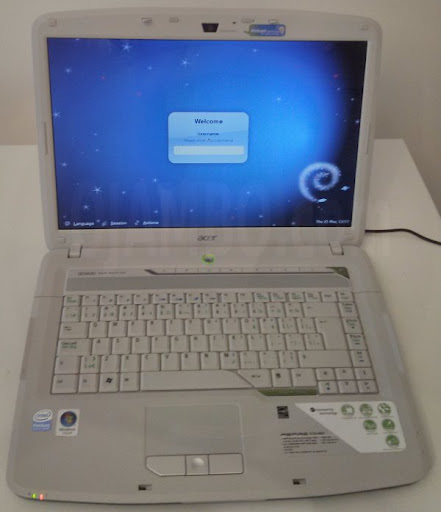 In conclusion, the Acer Aspire 5720Z is a good laptop. The laptop would have been great with the 4Gb RAM upgrade. Ojambo.com does not recommend products with manuals that print costly mistakes. Do not purchase the same adapter if a replacement is required. This entry was posted on Tuesday, March 26th, 2013 at 12:00 am	and is filed under Reviews. You can follow any responses to this entry through the RSS 2.0 feed. You can leave a response, or trackback from your own site.